Huawei is getting into the productivity game. The company, which recently made a splash in the U.S. with the launch of the Nexus 6p, announced a Surface Pro-like 12-inch Windows 10 tablet with a keyboard cover and an optional pressure-sensitive stylus and dock during its MWC keynote today. Pricing for the MateBook, which will be available with both Windows 10 Home and Professional, will start at $699/€799 for the most basic configuration with an m3 processor, 4 GB of RAM and a 128 GB SSD. The keyboard will click in at $129 and then stylus and dock at $69 and $99, respectively. The company says the device will go on sale in Asia, Europe, and North America in the coming month, but we weren’t able to pin down an exact date. We had a chance to spend some hands-on time with Huawei’s first attempt at a Windows hybrid earlier this weekend. As Huawei told me, the company aimed to take everything it learned from building tablets and phones over the last few years and put it into this new product — and that definitely shows. The tablet, which comes in both gray and golden, is lighter than it looks (at 640 grams), very slim and features a very nice 2160×1440 screen with only a very slim bezel around it. The unibody design definitely gives it a premium feel. One nifty little feature on the side of the tablet is a built-in fingerprint reader. For this, Huawei repurposed the technology it developed for its phones and brought it to Windows 10, so you can now unlock the tablet by simply putting your finger on it. 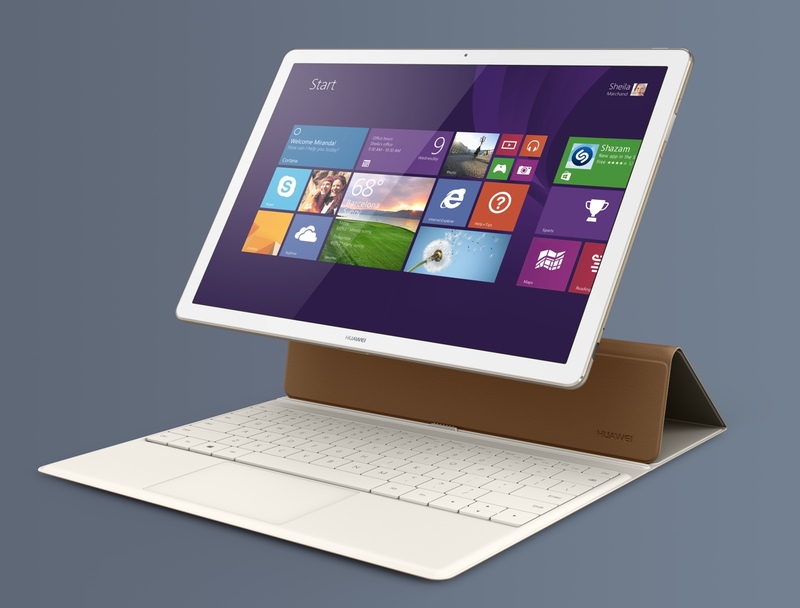 Windows 10 as a tablet operating system may not be everybody’s cup of tea and there aren’t all that many apps out there that make good use of the Windows 10 tablet mode, but you can’t fault Huawei for that. We did a bit of light surfing on the tablet and everything felt fast and smooth, though how well the Intel Core M-based system performs once we throw heavier tasks at it still remains to be seen. According to Huawei, the MateBook’s 33.7Wh high-density Lithium battery should allow for about 10 hours for standard productivity work (text editing, email, Excel, surfing the web, etc.). Just like you would expect from a modern device, charging happens over a USB-C cable and the tablet also features a fast-charging mode that promises to give you a 60 percent charge in about two hours. Unlike some of its competitors, the MateBook only features one camera, though — and at its 5MP resolution, it probably won’t be a great camera for taking pictures, but it should work just fine for your Skype calls. While I enjoyed playing with the tablet, though, the spill-resistant keyboard cover takes some getting used to. 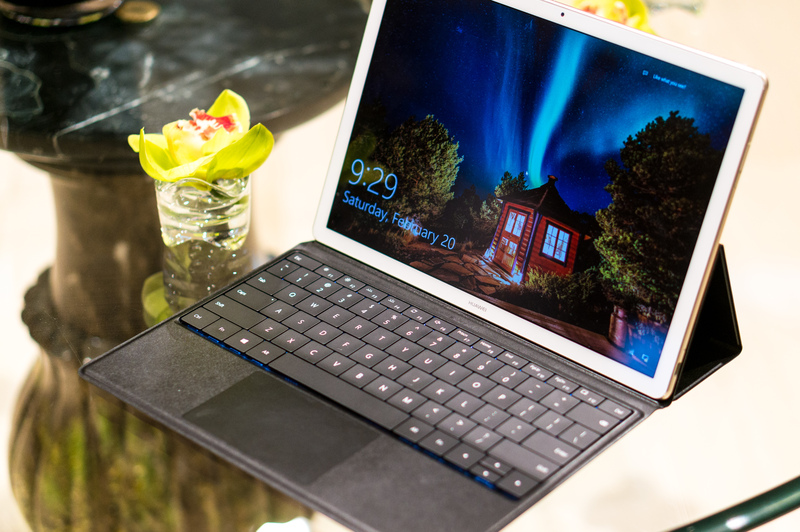 Microsoft’s Type Cover for the Surface still sets the benchmark for how to build a cover with a good keyboard. 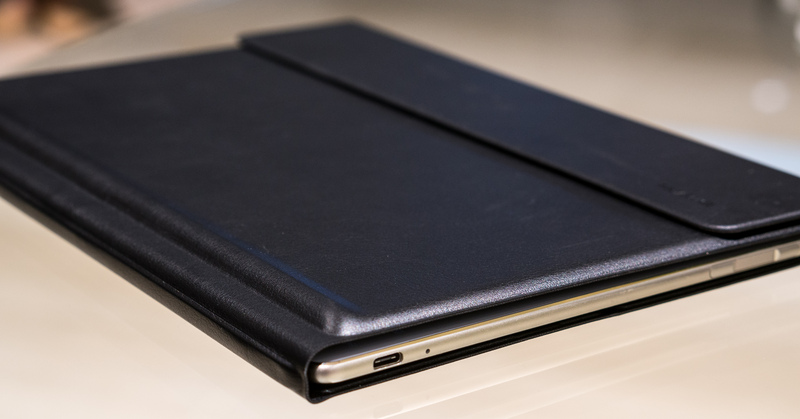 The fake leather cover looks nice enough and Huawei argues that it’s sturdy enough to protect the tablet from some falls. The chiclet keys themselves also feel good enough and have a nice amount of travel, but the case itself simply has a bit too much give. I probably need to spend a bit more time with it, but the keyboard definitely takes some getting used to. It’s worth noting, though, that the trackpad feels very precise. The keyboard — which is backlit — is powered directly from the tablet, so thankfully you don’t have to worry about charging it. It will come in four colors: black, brown, orange and beige. The pressure-sensitive stylus, which offers 2048 levels of sensitivity, works pretty much as expected. It connects over Bluetooth and Huawei says its battery should last a good month. The pen features both a button that turns the pen into an eraser and one that can function as a clicker for your PowerPoint presentations. As an extra gimmick, it also features a laser pointer (which may actually be quite useful when you use it to give a presentation). For giving those presentations — and for working at your desk — Huawei will also offer a small USB-C dock that includes two standard USB ports, an Ethernet plug, and VGA and HDMI outputs.